Coins from period of Alexander the Great seized during attempt to smuggle them into Israel from Gaza. An attempt to smuggle a set of ancient coins into Israel was foiled at the the Erez Crossing on the border with Gaza Sunday. 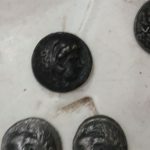 An Arab smuggler was caught with four coins which are believed to date back to the time of Alexander the Great of Macedon (356-323 B.C.E.). The smuggler is believed to have brought the archaeological finds from Egypt into Gaza with the intent of selling them in Israel. The suspect was detained for interrogation and was prevented from entering Israel. Representatives of the Israel Antiquities Authority were summoned to the Erez crossing to conduct an in depth examination of the coins.